Hello and welcome to Mike's world, the world of Master Clock Repair. We are grateful that you have chosen to visit our web site and we hope you find the information you are looking for. Michael has been performing in home repairs on floor clocks for over 40 years. It is unlikely that anyone in Central-Ohio has made more house calls than he has. We conservatively estimate that he has made over 22.000 calls throughout Ohio and even into bordering states. He is recognized by the American Watchmakers Clockmakers Institute as an expert in this field as he has taught a number of classes over the last 20 years sharing his knowledge in this area with other clockmakers. If you need help with your floor clock please give us a call so we can give you more inforation, quote you a fee and schedule a house call. Please consider "liking" our Facebook page. 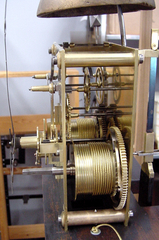 We will periodically post information about recent clock repairs, tips on what to look for when buying used or antique clocks, what you should know when visiting your local clock repairman as well as answer your basic questions related to clock repair. Click the link below to go to our page. Thinking of Buying a Grandfather Clock? We offer great prices on guaranteed used floor clocks! We still have several left at great prices. Priced for quick sale. Get yours now before they are gone. Click HERE for details on what is still in stock. Contact information is found on our Contact Us page as well as at the bottom of each and every page on the site. When you really care who repairs your clock why should you choose us over other clockmakers in your area? 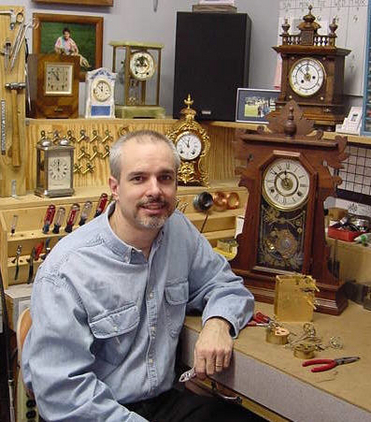 Because of Michael's unbeatable combination of an honest and friendly personality, extensive full time professional training, forty years of experience, and his Certified Clockmaker status to name just a few. He also has more independently verifiable qualifications that all other local shops combined and many, many more reviews. See Qualifications for more information. In addition, Michael's customers are often impressed with his ability to explain the condition and needs of their clock and can often offer several approaches to how the clock might be repaired. 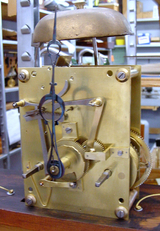 While a complete professional restoration is frequently required on many antique clocks and even some modern clocks over 25 or 30 years old it is not always absolutely necessary nor is it the only option. Mike takes the time to explain what makes a cost effective repair and or maintenance program as well as the benefits and risks of certain approaches to repairing the clock's problem. While Mike is the expert and will tell you his opinion concerning what is best, you are the clock owner and he takes into account your wants and needs. Another benefit that Mike offers is that he actually returns all calls and emails in a timely fashion. This should not be unusual but in this day and age it has become quite rare. All calls received during business hours are returned that day. If you call after hours he will attempt to return your call the next day. In 2018 Michael is celebrating his fortieth year in the clock trade. During this time he conservatively estimates that he has repaired over 40,000 clocks including over 22,000 house calls. Therefore you can have great confidence when leaving your clock with him. After all, two museums do. Michael has done restorative work for both the Georgian Museum in Lancaster and the Union County Historical Society in Marysville. Due to all of Michael's experience and expertise it would be natural to assume that having your clock repaired at Master Clock Repair would be very expensive. Not true! Mike boasts one of the lowest, if not the lowest house call price in Central Ohio. Even his restoration work is often considerably lower than other shops, both locally and nationwide. Take some time to browse through this information packed web site and discover what so many others already have. We take great pride in offering a friendly professional clock repair service to our customers. We hope you will give us a chance to serve you. If you would like to read reviews by some of our customers or perhaps leave one for us, please visit the Yellow Pages web site by clicking on this link. Doing so will open up a new page in your browser window and take you directly to the review page on that site. We are more than just a repair shop. We also sell clocks. Our specialty is offering great prices on "refurbished" Grandfather Clocks. 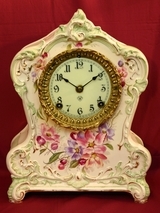 We also have restored antique Wall and Mantle clocks as well as used Cuckoo Clocks. Do not buy an antique clock anywhere else before you talk to us.